Vaultz Media Binder offers the ability to customize your contents. Since these sturdy units contain a standard three-ring binder mechanism, they accommodate binder insert pages that hold CDs, DVDs, Diskettes, business cards or just paper. Your contents stay safe and secure with combination locks, and the aluminum and steel reinforcements offer protection. The nylon shoulder strap and smooth chrome handle offer comfortable carrying options, while rubber feet prevent surface scuffing and sliding. The black interior features soft felt and mesh pockets. 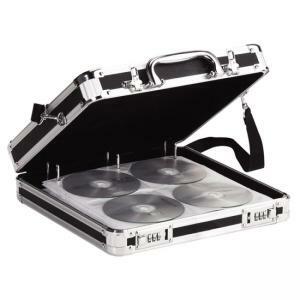 Binder includes 25 CD insert pages that hold up to 200 CDs/DVDs.